Our steel entry doors are a great option that give you a clean smooth finished look that come primed for custom painting. Plus, if you want to spruce up the look and style, simply chose a decorative glass for the door and have us paint it an accent color of your choice for a unique look for the entrance of your home. Entry doors are your way of greeting guests so make no mistake a steel entry door offers high security but amazing built-in beauty for a lifetime of living too! Steel Entry Doors combine the beauty and strength of 24 gauge galvanized roller coated steel with it’s engaging painted wood edges and ‘J’ Bend for a positive interlock. The prime painted entry door is a roller coat prime-baked to the steel before the steel is made into the entry door. This higher grade finish is by far superior than anything else that can be sprayed on later to an entry door. The white finish painted entry door is a roller coat finish features a “Poly-Tex” finish that is an extra hard finish that, due to the texture, reduces scratches or scuffs, too. The rigid polyurethane foam core bonds the entry door assembly and provides an insulation value to the steel entry door that is 4 times greater than a wood entry door. The punched, routed lockset and dead bolt bores are reinforced with wood lockblocks (9″ in prime and 12″ in white) for extra strength and security. Steel entry doors offer some options for entry doors that other doors may not have. 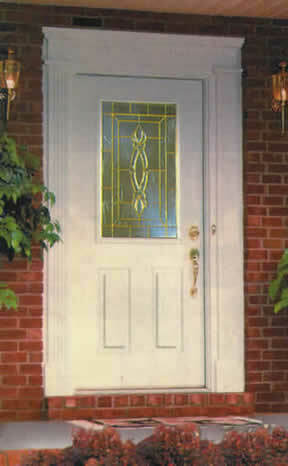 Perhaps you want that simple clean look but do not need the wood grain look of a wood entry door? No problem, a steel entry door is the best solution for you. Add in a decorative glass option and you can create an enhanced entrance to your home only you deserve and will enjoy every time you come home too. ABC Windows And More is available to come out to your home for an in home expert consultation to show you all the entry door options available today for steel entry doors and more. Simply contact us by clicking Here, or just call us now at 419-931-6573! We’re ready to answer all your entry door questions and more! Remember, calling us is as easy as A-B-C!